Is the Camino de Santiago on your bucket list? Always wanted to walk the Way of St James and meet new people? CaminoWays.com guided tours are perfect for travellers who would like to make new friends or share their Camino de Santiago experience with other people. These are our new Camino de Santiago Guided Tour dates for 2014, just released, with more departure dates per month. Our qualified and experience tour guides will assist and lead the group, sharing their knowledge of the local cultural, history and heritage. 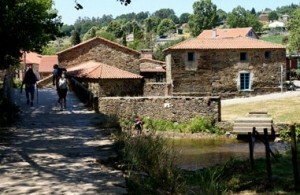 Go for the classic French Way Camino, walking 100km from Sarria to Santiago, or the Walk and Coach covering the last 300km with a support bus so you can walk the highlights of the Camino at a relaxed pace. The Finisterre Way, heading to the ‘End of the World’ in Galicia’s Atlantic Coast, and the Portuguese Way last 100km from Tui are also popular guided tours. CaminoWays.com guided tours also include airport transfers and half board accommodation, as well as our holiday pack containing maps, luggage tags, general information and directions. Guided Tours depart on specific dates, running from March until November. Thank you for making contact with us, you actually just started organizing! We will send you an email soon, you will see how easy it is to let us organize everything for you. would love to do the camino walk but where do I start orinazing? Hi Patricia, we’ll try to post more images of the guided tours, hotels, etc… in the future. Thanks for your feedback. Kind regards. I’d like to see more images of the place to see how relaxing it is to have a tour date there. Also, I’d first like to check the amenities they have to offer so that we can really enjoy. Better head on to their website for more information.